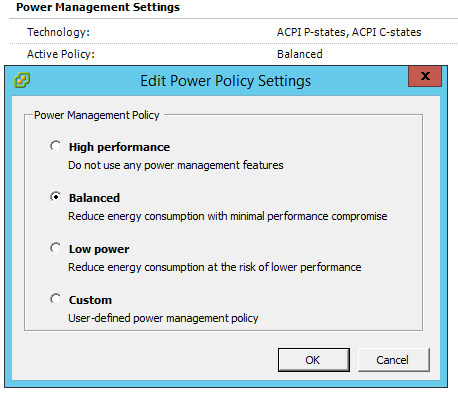 VMware’s Performance Best Practices mentions you should set power management in the BIOS to “OS Controlled Mode” or equivalent. This is so you can control power saving from the hypervisor itself. It’s very useful when you want to change these settings on the fly without having to reboot into the BIOS, similar to how Windows power profiles work. My VM’s felt “snappier” after the change. It’s hard to avoid speaking subjectively here, but click-to-action felt quicker. Maybe it’s in my head, but I feel those charts tell a different story. The effect the “Balanced” power savings has on CPU Ready times is clear as day, though it’s mentioned that Balanced has minimal to no impact on performance. I have yet to do benchmarks to show how CPU Ready% affects real workloads, but at the very least, CPU instruction latency from a guest VM is dramatically decreased, which benefits those real-time workloads like Lync, Skype for Business or VoIP.